It’s unfortunate that readers don’t stray from the three largest publishers more often, because there’s some interesting stuff happening in independent publishing right now. Black #1 (Black Mask Studios) is one of several books from Black Mask Studios that’s making waves and earning acclaim, along with titles like Kim & Kim, We Can Never Go Home, and Jade Street Protection Services. 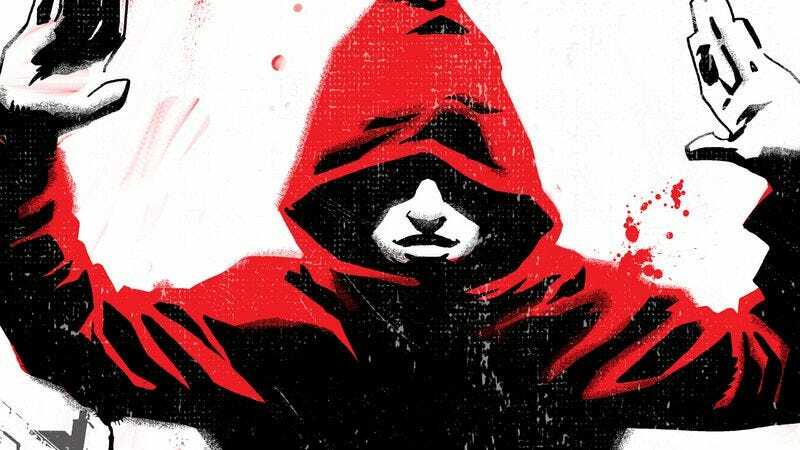 Black is premiering at the perfect time: Audiences are primed to read more books by and about black superheroes, particularly those confronting institutional racism and police violence. The book drops readers immediately into the middle of the action as an NYPD officer is questioned about a police shooting she witnessed. Ellen Waters, who disappears from the pages fast enough to leave both skid marks and the hope she’ll return, describes the shooting of a young, unarmed black man by police officers, lamenting the lack of community and institutional knowledge within the police force. What happens next is where Black shines. Kareem Jenkins, shot several times by an unnamed officer, recovers almost immediately in an ambulance and begins a game of cat and mouse with the police and the government agents that have been watching the whole thing go down. He escapes, but only with the help of an unnamed man who promises to show Kareem what he can do and why. The basic premise—the root question of Black—asks us to imagine a world where superpowers exist, and only black people have them. Even just asking that question is a powerful statement of intent, and the whole team delivers answers that force a lot more thought than people might assume about a comic book. Black is a mix of The Matrix, Static Shock, Dynamite’s Shaft, and some of the better Weapon X story arcs. Even the art, by DC veteran Jamal Igle with tones by Sarah Stern, is reminiscent of the recent Shaft books and Bilquis Evely’s soft, retro styling. Writer Kwanza Osajyefo brought Igle, along with designer Tim Smith III and editor Sarah Litt, together to launch a hugely successful Kickstarter for Black earlier this year, but the partnership with Black Mask Studios is what will get the book into even more hands. Marvel Comics published original graphic novels throughout the ’80s, but abandoned this endeavor just as the format was gaining traction in the mainstream. Recognizing the changing tides of the comics industry, Marvel launched a new line of original graphic novels in 2013, but none of these books have been targeted to the lucrative all-ages graphic novel market. That changes with The Unbeatable Squirrel Girl Beats Up The Marvel Universe! (Marvel), a new story by the regular The Unbeatable Squirrel Girl creative team that pits Doreen Green against an equally unbeatable opponent: herself. Doreen is accidentally cloned when she’s thrown in a machine created by the High Evolutionary, and her duplicate (given Doreen’s middle name, Allene) takes her love of squirrels to maniacal levels as she plots to create a squirrel utopia on Earth. The Unbeatable Squirrel Girl Beats Up The Marvel Universe! offers readers exactly what they would expect from the main ongoing series—a silly plot that praises the power of friendship, teamwork, and computer programming; vibrant, expressive artwork; a never-ending stream of jokes and gags—but it’s all bigger. The creative team takes full advantage of the expanded page count to give readers more of what they love, along with added bonuses like an “interactive fight scene interlude” activity spread containing a guide to drawing Squirrel Girl, a word search, and a connect-the-dots image of Doreen leaping into action. That playful quality is what makes The Unbeatable Squirrel Girl such a great comic for younger readers, and this graphic novel goes even further to spotlight just how fun a superhero universe can be. Writer Ryan North delights in finding creative ways for Squirrel Girl’s dark doppelgänger to take out the biggest names in the Marvel Universe, like dropping The Thing on Magneto (because he’s made of non-ferrous rocks) and calming the Hulk with an adorable lady squirrel offering him a peanut. As goofy as it all sounds, North is also telling a substantial story about power and responsibility in the classic Marvel mold. Doreen feels a strong sense of responsibility toward helping both humans and squirrels, and Allene reveals what would happen if Doreen was solely fixated on the latter. Allene’s road to the dark side is paved with good intentions as she tries to save all squirrels from the humans who run them over and ruin their environment, and while her methods are totally bonkers, the script gives readers a strong understanding of why she embraces a life of supervillainy. One of the most exciting things about reading The Unbeatable Squirrel Girl is witnessing Erica Henderson’s dramatic evolution as an artist, and The Unbeatable Squirrel Girl Beats Up The Marvel Universe! represents another major step forward for her as she takes over coloring duties from Rico Renzi (who still contributes to this graphic novel by providing Deadpool Trading Card art). The results are fantastic, and Henderson reveals a strong talent for establishing mood in her coloring, using quieter palettes when the story needs to be grounded and incorporating a wide spectrum of bright colors when the superhero fantasy comes rushing in. Tillie Walden’s comics are often concerned with space, in all its forms. In “Too Much,” a girl, rendered as a lumbering giant, lurches across a shrunken city, a visual cue she repeats in “Summer Is The Worst.” Her “Find Me” concerns a girl lost in the woods, and she represents this visually by obscuring and revealing shapes and figures in a juxtaposition of blacks, whites, and pinks. And in “You And Me,” Walden composes her comic out of what Scott McCloud calls “aspect-to-aspect” transitions, building her vignette out of snapshots of a space. In On A Sunbeam (Webcomic), Walden makes literal this idea and sets her serial in outer space. The series appears to concern a girl named Mia in two stories (two times in her life; possibly even two realities). In one, she is the new member of a spaceship crew that has been tasked with the restoration of monuments. In another, she is enrolled in “Cleary’s School For Girls,” which is placidly floating in space. In both, Mia is dwarfed by the sheer scale of her surroundings. Walden draws buildings with incredibly tall ceilings, arched doorways, and rose windows that recall Gothic churches. In some panels, she eschews backgrounds altogether, setting her characters against a massive-seeming backdrop. She’ll set the character far in the background, and perspective will make them appear tiny. It would be easy for a cartoonist to use this scale and juxtaposition to create a sense of loneliness and alienation. Walden’s comics, however, are warm and charming. Her thin lines—often simplifying finer details into abstractions—and immaculate draftsmanship cultivate a palpable expressiveness. Rather than feeling oppressed by these spaces, her characters and, more importantly, her readers, marvel at them. It is apropos that her buildings so readily recall medieval churches—material tributes to God—because they similarly feel built to inspire awe. In this way, Walden’s comics are contemplative. Though most of the series’ first chapter is given to moments of action, character introductions, and relationship building, it is punctuated by stillness, with pans across vistas, and it is these moments and images that most memorably stick with you.